Blogs that show code in the posts should provide a distinction between the text and code. This helps visitors identify code easily and copy it for their use. With WordPress, differentiating between code and regular text becomes quite simple. This can be achieved via two options. First option would be to install a plugin while second is to make a code change. There are many plug-ins available for example auto-syntaxhighlighter. However if you are like me, you would want to avoid plugins if you can and achieve the same result with some minor HTML code changes. After all, plug-ins are not always up to date with latest WordPress version, especially if they are free. 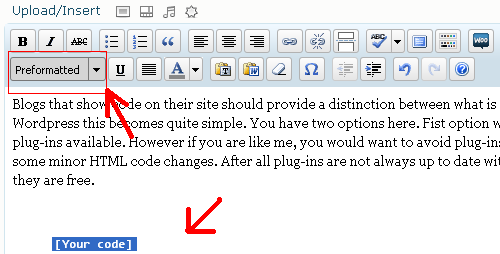 In order to use Pre and Code tags, first select the relevant text from the visual editor and make it preformatted. This basically directs the browser to show the text as is without any changes to it’s format. This should show text like this. 1. Open your theme’s style sheet called style.css. If you cannot locate it then you can just copy it from above and paste it. But if it exists already make sure that “overflow:auto;” is part of the definition because that provides scrolling bars when a preformatted text line is too long. That is it. You should now be able to use WordPress pre and code tags effectively.